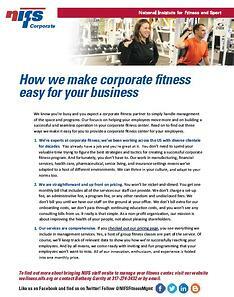 Let us handle your corporate fitness program so that you can get back to doing what you love to do. We've been managing client's fitness centers for decades. There won't be rookie mistakes to clean up. You won't have to decode our monthly invoice because our pricing is uncomplicated. Your employees will love our staff and the comprehensive services we offer. We're easy to work with and we know how to make your corporate fitness center inviting for your employees. Download the quick read to find out more.